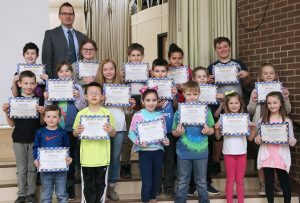 VOLNEY – A couple dozen students at Volney Elementary School were honored at a recent assembly because they had either exhibited perseverance in the classroom or made goal progress throughout the month of March. 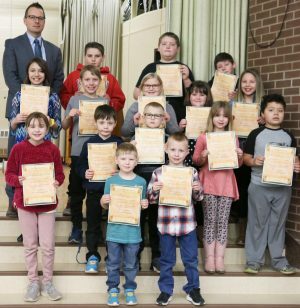 Volney Elementary School students who received a principal’s award from Principal Todd Terpening, top left, show off their certificates during a recent school assembly. Vander Buske, Drake Ives, Alyvia Williams, Malaki Cary, Nick Childs, Cadence Nipper, Jason Scott, Elliemae Austin, Bella Vant, Wyatt Conger, Dean Breitbeck, Rachel Asker, Gracyn Cantine, Declan Nickerson, Molly Rockwell, Chase Turner, Nazzerene Donalson and William Wright. On a Roll awardees at Volney Elementary School were thrilled to receive their certificates from Principal Todd Terpening, top left.